Forget your crystal-encrusted wand and your altar inscribed with magickal symbols. It doesn't matter how much they cost, they cannot help you in your spellcraft. Instead walk outside, feel the earth beneath your feet and listen to the whispering of the wind. Pick up a stick fallen from a tree as your magical tool, let a simple stone be your altar. Drink from the well of life and let the sun and the moon guide you in the ancient ways of magic. That was, in essence, the message Phiona Hutton gave in her talk, Avalon Whispering: Healing from the Ancient Ways, at Witchfest International earlier this month. Avalon, the legendary isle where Excalibur was forged and where King Arthur was taken to heal from his wounds, is a place we can all find, according to Phiona. It is, perhaps, a real place in another plane. Or perhaps it is a metaphor for the magical essence of our own world that we often fail to notice as we rush about in our busy lives. If we take time to attune ourselves to nature - to listen to the wind in the trees and the birds singing and feel the earth beneath our feet - we can learn to step through the mists of Avalon, which is the veil between the worlds. Once we have done that we can start to learn the wisdom of ancient times and our magic will be all the more powerful for it. This is also the message in Phiona's new book of poetry and inspirational words, From The Whispers Of Avalon. Who is she who walks this path? She lives within you and within me. She is the divine ancient soul of the Great Mother that runs though our veins. She is the breath of the morning breeze, the whisper within the bird song. The warming fire within your hearth. The gentle shower of the spring rain and the torrential rains of the fall. She is the balance within us and around us. She is the truth within our hearts. ...To learn the lessons that are bestowed upon us. To at times walk within shadow. But at all times to walk with the ancients openly as we listen to their guidance. Be it the bird that flies past us. The raindrop within the spiders web. The unique flower that opens at spring. Embrace all as you learn and grow and become the priestess of Avalon. I liked Phiona's talk. Her style of simple magic, in tune with nature and the world around us, is very much in keeping with the magic I mainly use when I am not working in a group with a specific tradition. I also liked Phiona's book. 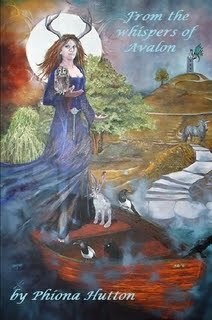 Her poems range from charming and easy-to-read verses about such things as the Isle of Avalon, the fae and mythological beasts to passages offering insightful teachings about the Craft, written as poetry. It is a book to dip into for inspiration, to cheer you up when you are feeling down or just to read for pleasure.